The Eurovision Song Contest is the ultimate and greatest number one entertainment show-event on the planet earth. Every year since 1956 a growing number of countries choose one song to represent their country in an opulent state-of-the-art worldwide broadcasted television show. An international audience and professional juries from each participating country then select their winner in an exciting and thrilling voting procedure. The ESC reaches about double the audience as the superbowl, it is watched and enjoyed all over the world as the Eurovision Europe happily includes countries like Russia, Israel, Turkey and even Australia. There are many more countries like the United States and China staying awake the whole night or getting up very early to watch the show. The ESC makes people come together in the spirit of Love, Peace, Peace, Love and tricks in a hamsterwheel, old women baking bread or a man simply skating around. There are fireworks, costume changes and wild dances that are building the bridges between the individuality of the songs and the uniting of different people to celebrate diversity. That is the spirit we share in Star Trek as well as in the community that builds Stonewall. That is why we decided to bring the three together in a modern fairytale under the same sky. Join us on May 11 for a virtual show of glamorous glitter, timeless trash, true fantasy and stunning vocal performances. We rendezvous on Risa and travel through the whole galaxy for events of fun and happiness. We show ourselves amazing costumes and dance in total synchronicity, if we feel the rhythm, and we share the knowledge of bringing the people together with the music they sing in the confluence of sound. So light your fire because we are one. Feel your heart beat and share the moment: #yourovision. Hello Fleethearts, hello World, hello Universe and beyond, this is Berlin calling! 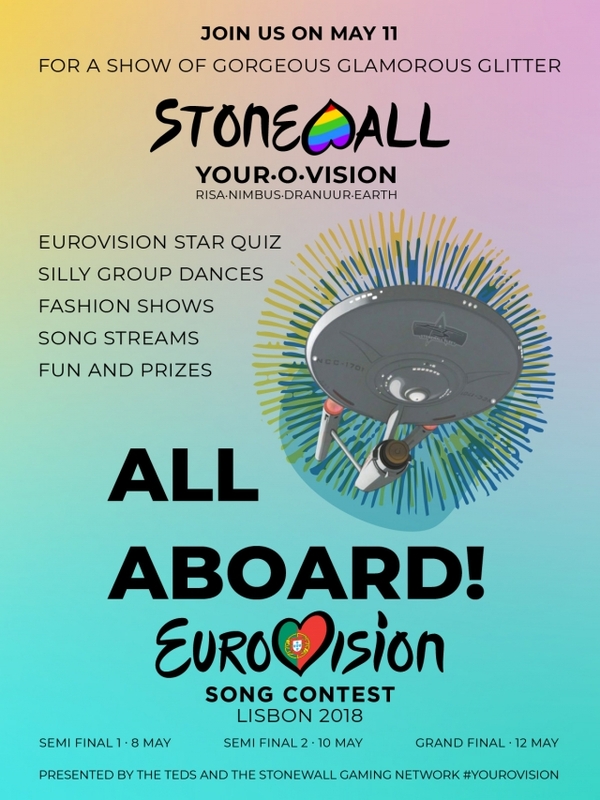 As you already noticed, we will celebrate the Eurovision Song Contest 2018 in our very own special Stonewall way, with an amazing and highly enjoyable Fleet-event, the Stonewall #yourovision. The Party will be on Friday, May 11th, at the shores and beaches of Risa and Dranuur, as well as in the clubs and bars of Nimbus and Earth Space Dock (ESC on ESD, you know?). In this post we'll keep you informed about what the ESC is and how we will embrace it. Stonewall Yourovision - A show of gorgeous glamorous glitter! We'll start the event on the main dance floor at our favourite shore leave planet Risa. Be sure to bring love, fun and your rainbow balloon gun! Dance it off on Risa with your fleeties when we perform the STO Emote version of the famous Eurovision 1981 winning song 'Making Your Mind Up' from Bucks Fizz. Meet us in the club and desert of Nimbus for an amazing show of Eurovision fashion. Don't forget your sun-blocker! Let's listen to the songs that made it through the Eurovision First Semi Final. You will need a browser with youtube to do so. Checking out the green room: While we relax on the shores of Dranuur Colony we will play a chat based multiple choice quiz about the stars of Eurovision! The Safe Six are the Eurovision participants that are already qualified. Let's listen to their songs. You need a browser with youtube to do so. The second half of our fashion show-off will be on the dancefloor in the Club 47 at Earth Space Dock. Don't forget your sunglasses! As you already know, you will need a browser to listen to the songs that qualified in the Eurovision Second Semi Final. We close our night of sounds, music, songs and fashion with another Silly Group Dance Perfomance on the main dancefloor on Club 47 on Earth Space Dock. Lets rock the house! Yourovision Winner Announcement and Party Gathering: All night long! All over now? No, not in Stonewall Fleet! We will party all night long as we announce the winners of the fashion contests and the quiz. Stay tuned! All in the Eurovision Song Contest circles, as the name states, around the songs. Everything else might be important, but the songs are essential. The Contest was started with the intention to unite Europe with the means of a language that we all speak: music. That's why the most important part of the contest are the songs and their composers and writers, then the performers and musicians, and last but not least the show around it. Every participating nation in the contest has different methods of choosing a song that should represent their country. Some are chosen by a jury of some kind, others are determined by a competition like the Sanremo-Festival in Italy or the Melodifestivalen in Sweden. 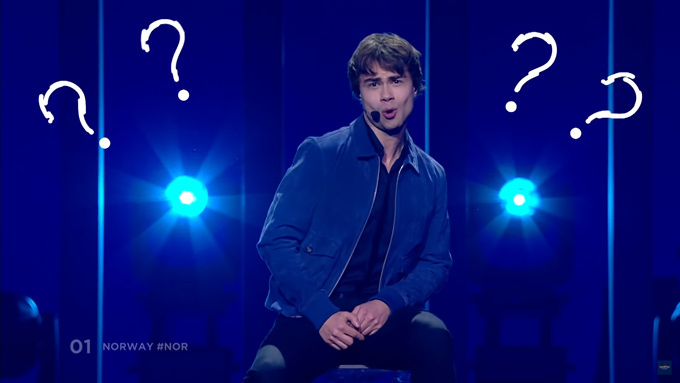 However, at a given date end of March, the EBU (European Broadcasting Union) closes the application, and the participants are raffled into two semi-finals. Only the so-called Big Five (that are the countries which finance the contest: Spain, Italy, Germany, France, United Kingdom) and the host country will have a guaranteed ticket for the grand final. In 2018 there are 43 countries competing. In the Yourovision Event we will listen to the songs together. We've decided to stream them via Youtube because not all of our fleetmembers have a discord account. While we listen to the songs we will provide you with additional informations about the song entries, their composers and interpreters, the countries they represent and other interessing facts via our ingame chat channel. All Eurovision Song Contest fans out there know, when it comes to how-to-win-the-contest, one important component is the style. You can break the rules of fashion and your chance to win shall grow. Costumes make up much of the unforgettable impression you get from a performance, as the swedish winner ABBA showed us with their victory in 1974. Also, costume changes live on stage can help too, as introduced by the british winner Buck Fizz in 1981. To honor and enjoy the eye candy factor of Eurovision, we will do fashion contests as part of our event. Please look here for categories and voting rules: Yourovision Fashion Contest. There are so many facts and useless knowledge around the ESC, it's almost like Star Trek Canon! First we have the rules, for example since 1957 every Eurovision Songs can only have a maximum duration of three minutes. The stage crew can consist of up to six artists who are at least 16 years old doing - anything, like ice-skating for example, but no animals. And, ehem, theoretically, songs with a political message are not allowed to enter the contest at all. Then we have the stars - gorgeous icons and divas like Conchita Wurst, Celine Dion, Johnny Logan and Patricia Kaas and so many more. 2 Stonewall Credits, 1 lockbox key, and an unlock code for a Scorpion fighter! 1 Stonewall Credit, 1 lockbox key, and a mystery item box! 1 Stonewall Credit and a mystery item box! Do you remember the times back in the fifties and sixties, when the contestants in the 'Grand Prix de la Chanson' where just standing around while singing their song? Nowadays most singers and artists give their best in impressing the audience with their moves, like Ruslana did in 2004 with her winning song 'Wild Dances'. We will try to do the same, as we want to do some silly and fancy group dances with you! But you never know and the contest also has a history of surprise winners that nobody expected, like Salvador Sobral last year. That's why we will do a heavy betting, in which you can win fantastic prizes (that means a lot of EC) with your bets on the winners and losers. Please look here for additional information and rules: Yourovision Heavy Betting Game. There are many many different songs in the Eurovision Song Contest. Not all of them are to be liked, and not all of them are good either. But some of them are rather special, and many are really great stunning masterpieces. What do you like? What do you dislike? We will do a great poll amongst our fleet in a seperate forum thread, so you have the chance to express your personal favorites of this years contest. We will also calculate all our votes up and this will give us the results of the Stonewall Jury! There will be a small participation reward for telling the community your thoughts. Meanwhile, have fun, please be patient and enjoy the Eurovision Song Contest while you wait for (y)our #yourovision. Love all the quotes and eastereggs, Ted! I see we have a real fan at work there! Looking so much forward to that event! Congratulations to the winners! We hope you enjoyed the Quiz as well as the event!